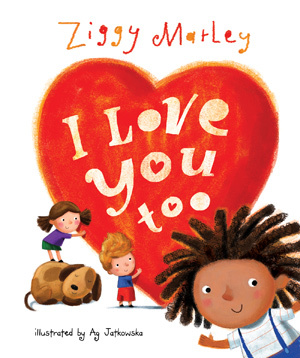 Under the partly sunny sky of Southern California spring, Ziggy Marley ambled onto a stage assembled for his special appearance at the Grove, a Los Angeles shopping plaza, carrying his son Abraham in one hand and his debut children’s book I Love You Too in the other. Before a crowd of several hundred mothers, fathers, and children, Marley and his son together read the book based on the Grammy winner’s lyrics from the song of the same title released on his 2009 album Family Time. “That shows the practical application of the book; for children and parents to read together,” Marley noted afterward. Sitting in a folding chair and accompanied on percussion and harmony vocals, Marley also performed three songs for the adoring audience. Family Time, I Love You Too, and Three Little Birds delighted the high-noon crowd, enticing young and older alike to dance and sing along. It was brief, but entertaining and a rare opportunity for families to enjoy the reggae superstar in such a unique setting. “With children, it’s always good,” Marley offered. “A pure vibe. A pure spirit". Following the presentation and performance, Marley walked to nearby Barnes and Noble to sign copies, engaging with several fans during the short stroll from park to store. The book, I Love You Too, is available now in limited printed and e-book formats.